Soybeans started firm, but couldn’t end that way, as strong results from the early harvest trumped putative concerns over the impact of a debilitating disease. The talk over “sudden death syndrome”, or SDS, which Agrimoney.com highlighted on Friday hit the mainstream. In Chicago, Richard Feltes at RJ O’Brien noted “reports of soybean SDS”, while in Minneapolis, CHS Hedging flagged that “sudden death syndrome has been found in Illinois and Missouri soybeans”. Also in Minneapolis, Benson Quinn Commodities noted that “talk of ‘sudden death’ in the soybean crop is gaining more attention”. However, if that encouraged some early short-covering on soybean futures, investors felt encouraged to put in fresh sales by the strong yield reports issuing from the early US harvest. At Allendale, Paul Georgy noted harvest reports from Mississippi at 75-90 bushels per acre, and Louisiana at 65-100 bushels per acre, ie in some areas more than twice the national average that the US Department of Agriculture is factoring in. Richard Feltes, noting 96 bushels-per-acre soybeans in Yazoo, Mississippi, and talking of “unbelievable record yields”, said that the results were likely to put the brakes on any rallies. Indeed, it somewhat took the wind out of the sails too of investors hoping that frost fears might keep prices of soybeans, and corn, supported. In fact, while “there is still a freeze premium in the market”, weather models “do not indicate any cold air moving into the [Midwest] crop areas over the next two weeks,” Darrell Holaday at Country Futures said. And “once we get past September 18-20 area, it will become a moot point”, with crops too mature to be seriously affected. 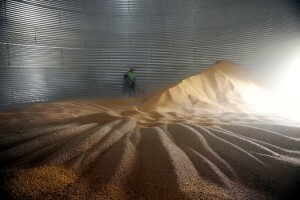 As an extra negative, Fintec Group noted talk of Chinese soybean crushers “not being able to receive letters of credit open for 4-5 soybean cargoes”, besides rumours that one or two Brazilian soybean cargoes had been resold, an echo of what went on earlier in 2014. Soybeans for November fell 0.4% to $10.23 ¾ a bushel, a fresh contract closing low, although there was enough concern over near-term supplies to lift September soybeans 1.0% to $10.85 ¾ a bushel. After all, September soymeal soared 7.2% to $416.50 a short ton. “US processor margins are extremely favourable for those plants that can source soybeans,” Terry Reilly at Futures International said, noting that “there are now no soymeal truck offers at several locations across the western Corn Belt”. Corn fared a little better, holding its ground at $3.65 a bushel for December delivery, against a background of yield reports which, while favourable, were not so outlandish as for soybeans. “Corn yields are coming in at 170-190 bushels per acre” in the Delta states, Allendale said. Weekly ethanol data held some cause for optimism too, even while revealing production down 24,000 barrels a day to 913,000 barrels a day last week. Inventories plunged 934,000 barrels to 17.32bn barrels, indicating demand for the biofuel. It also took some of the attention away from a downbeat price forecast by Bill Tierney, at AgResource, who forecast an average corn price of $3.40 a bushel this year, and said prices could drop below $3 a bushel from 2015-16 to 2019-20. Again, corn found some support from wheat too, as the Ukraine concerns revived on news that pro-Russian rebels had entered Novoazovsk in the south east of the country, amid claims of fresh incursions by Russian troops too. Oleksander Danylyuk, an adviser to Ukraine’s defence minister, said that the country was “increasingly facing genuine Russian soldiers in addition to mercenaries armed by Russia on the other fronts in the Donetsk and Lugansk regions”. With Ukraine a major exporter of competitively-priced wheat, the wheat market has been something of a barometer of regional tensions. However, the threat from the move into Novoazovsk may be particularly acute in that it edges rebels closer to Mariupol, an important port for trade in goods including grains. There is growing concern too over the threat posed by harvest-time rains to the quality of the US spring wheat crop. While some regons are drying out “from last week’s deluge”, which should enable an acceleration in harvesting at least, “many areas are still dealing with a sloppy track”, Benson Quinn Commodities said. Richard Feltes noted “reports of soaring Minneapolis wheat protein premiums as concern mounts that the hard red spring wheat crop will not meet high protein specifications demanded by millers. Still, it was Chicago soft red winter wheat, the speculator’s favourite, which outperformed, adding 1.0% to $5.62 ¼ a bushel, in what looks a sign of Ukraine factors proving the trump card. In Paris, wheat for November closed up 0.4% at E173.50 a tonne, retaking its 20-day moving average. Among soft commodities, New York cotton added 0.8% to 67.46 cents a pound for December delivery, its best finish in a month, lifted by continued ideas that last month’s sell-off went too far. Furthermore, there has been talk of weather threats for US cotton, ranging from ideas of excess rains in south east states where crops are sensitive now that bolls are open, to undue dryness in Texas. But raw sugar went back into retreat, shedding 0.8% to 15.58 cents a pound, after its gains in the last session on a downgrade by Unica to expectations for the Brazilian Centre South cane harvest. Talk turned more to the International Sugar Organization idea of another world production surplus in 2014-15, and ample world supplies. “The market seems to be waiting for the nearby physical oversupply to be clearly dealt with,” said Tom Kujawa at Sucden Financial.